[S558] The Wake County Genealogical Society, The Heritage of Wake County North Carolina. [S424] Compiler(s): Shirley Olson, Cemetery: Bagwell Cemetery, Wake County, North Carolina. Mary Willie Bagwell was born in 1820 in Wake County, North Carolina. She was the daughter of Littleberry Bagwell and Mary Walker. As of 20 December 1841,her married name was Bailey. Mary Willie Bagwell married Cullen Bailey on 20 December 1841 at Wake County, North Carolina. 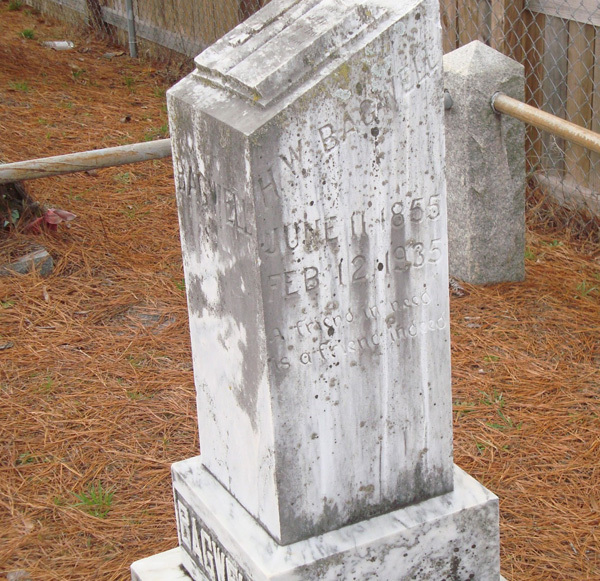 Mary Willie Bagwell died on 19 June 1855 in Wake County, North Carolina. [S5372] Email from Steve Mims dated November 2017 to Hunter Wayne Bagwell; Subject Line: Lee Poole Family. Cullen Bailey married Mary Willie Bagwell, daughter of Littleberry Bagwell and Mary Walker, on 20 December 1841 at Wake County, North Carolina. Mason Bagwell was born in 1830 in Wake County, North Carolina. He was the son of Littleberry Bagwell and Mary Walker. Mason Bagwell married Willie Jones on 30 March 1851 at Wake County, North Carolina. As of 30 March 1851,her married name was Bagwell. Willie Jones married Mason Bagwell, son of Littleberry Bagwell and Mary Walker, on 30 March 1851 at Wake County, North Carolina. [S377] United States Federal Census, Washington, District of Columbia, Population Schedule: Saint Marys, Wake, North Carolina; Enumeration District: 274; Supervisor District: 2; Page: 47, Dwelling: 485, Family Number: 485, Date: 1880. [S726] United States Federal Census, Washington, District of Columbia, Population Schedule: St Marys, Wake, North Carolina; Page: 106, Dwelling: 117, Family Number: 117, Date: 1850. 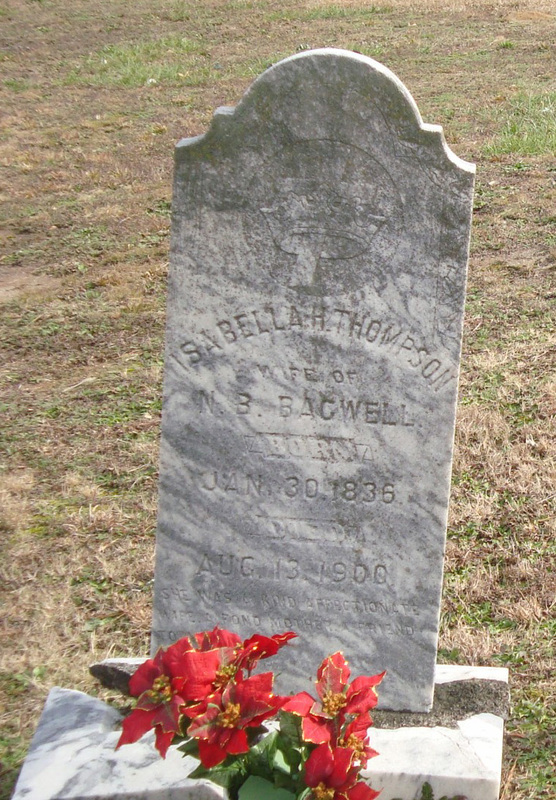 [S264] Isabella H. Thompson Bagwell Grave Stone, Find a Grave, www.findagrave.com. [S426] Henry W. Bagwell, North Carolina Death Certificate: Henry W. Bagwell. [S727] Mary Bagwell Poole, North Carolina Death Certificate: Mary Bagwell Poole. John Green Bagwell was also known as John Greenberry Bagwell. He was born on 20 October 1844 in Wake County, North Carolina.1 He was the son of Green Berry Bagwell and Ann C. King.1 Enlisted as a Private, Company D, 13th Battery (2nd Regiment, North Carolina Artillery). Edward Hiram G. Bagwell was born on 17 March 1858 in Wake County, North Carolina.1 He was the son of Green Berry Bagwell and Ann C. King.1 Edward Hiram G. Bagwell married Marjorie Price O'Neil in 1879.1 Edward Hiram G. Bagwell died on 15 January 1888 in Wake County, North Carolina, at age 29.1 He was buried at Morrisville First Baptist Church Cemetery, Morrisville, Wake County, North Carolina. [S260] Atlas S. Bagwell Grave Stone, Find a Grave, www.findagrave.com. [S266] Susanna Hood Bagwell Grave Stone, Find a Grave, www.findagrave.com. [S1250] Email from Doug Melzer dated February 2010 to Hunter Wayne Bagwell; Subject Line: Atlas Stanton Bagwell Descendents. [S261] William Burke Bagwell Grave Stone, Find a Grave, www.findagrave.com. [S683] Shirley Olson, Tombstone Transcriptions from Bagwell Cemetery, Wake County, North Carolina. [S425] United States Federal Census, Washington, District of Columbia, Population Schedule: Raleigh, Wake, North Carolina; Emuneration District: 136, Supervisor District: 4, Sheet: 28B, Dwelling: 509, Family Number: 533, Date: 1900. [S552] Email from MD Johnny Wayne Bagwell dated November 2008 to Hunter Wayne Bagwell - Subject Line: Wendell Bagwell Family History. [S386] H.W. Bagwell Grave Stone, Find a Grave, www.findagrave.com. [S387] Fannie M. Pool Bagwell Grave Stone, Find a Grave, www.findagrave.com. Mary Elizabeth Bagwell was born on 6 February 1857 in Wake County, North Carolina. She was the daughter of Needham Bryant Bagwell and Isabella Hawkins Thompson. As of 5 December 1878,her married name was Poole. Mary Elizabeth Bagwell married Sion R. Poole, son of Calvin Poole and Cathrine Green, on 5 December 1878. Mary Elizabeth Bagwell died on 1 July 1943 in Wake County, North Carolina, at age 86 Mary Elizabeth Bagwell was born 1857 in St. Mary's (Auburn), Wake County, NC, the 2nd of 6 known surviving children (4 boys/2 girls) born to farmers, Needham Bryant Bagwell Sr. and his wife, Isabella H. Thompson. She was the paternal grandchild of Littleberry "Berry" Bagwell and Mary Clara Walker, the "patriarch" of the Bagwells in Auburn. She was the gr-grandchild of Nathan B. Bagwell & Sarah "Sally" Mainor of Wake Co. She was the maternal grandchild of John C. & Elisabeth Thompson of Raleigh. When she was 21-years old, Mary married 24-year old Sion R. Pool/Poole on December 5, 1878, son of Calvin Pool/Poole and his (2nd) wife, Cathrine Green. The couple began married life as farmers in Auburn (St. Mary's), but later moved to Raleigh (c. 1900) where Sion opened a grocery store and Mary ran several boarding houses. They were the parents of 9 known surviving children (4 boys/5 girls): Hatti Lee (1881-1917), who married Angus A. McDonald; Alice T. (1883-1915), who married Sam Hodges; Grover Cleveland (1887-1961), who married Fannie Elizabeth Norris; Exter G. (1890-1941); Eugene (1892-died young); Melvin (1894-1896), Carrie (1896-died young); and Margie Louise (1900-1986), who married Famous Mark Mann. Mary was widowed at the age of 55 when her husband of 34 years passed in 1912 at age 58. Following the death of her daughter, Hattie Lee Poole McDonald in 1917, she raised her 3 McDonald grandchildren. Mary survived her husband another 30+ years, passing in 1943 at age 86. She was buried at Mount Moriah Baptist Church Cemetery, Raleigh, Wake County, North Carolina. Calvin Berry Bagwell was born 1860 in St. Mary's (Auburn), Wake County, NC, the 3rd of 6 known surviving children (5 boys/1 girls) born to farmer & merchant Needham Bryant Bagwell, Sr. and his wife, Isabella H. Thompson. He was the paternal grandson of Littleberry Bagwell and his (1st) wife, Mary Clara Walker; and the maternal grandson of John C. Thompson (1801-1871) and Elizabeth Mabry (1798-1868) of Wake County, NC. For reasons unknown, Calvin and Martha separated sometime before 1920, when Martha removed to Salisbury Street in Raleigh an opened a boarding house with her daughters Pattie, Etta, and Isabell, where they remained until their deaths. He was buried at Bagwell Family Cemetery, Garner, Wake County, North Carolina. [S378] United States Federal Census, Washington, District of Columbia, Population Schedule: Auburn, Wake, North Carolina, Emuneration District: 148, Supervisor District: 4, Sheet: 9B, Dwelling: 113, Family Number: 111 or 115, Date: 1900. [S380] United States Federal Census, Washington, District of Columbia, Population Schedule: St Marys, Wake, North Carolina, Emuneration District: 142, Supervisor District: 4, Sheet: 4B, Dwelling: 69, Family Number: 73, Date: 1920. [S376] Email from Kelli Bagwell dated September 20, 2008 to Hunter Wayne Bagwell - Subject Line: Bagwell Family History (Calvin Berry Bagwell). [S399] John Bryant Bagwell, North Carolina Death Certificate: John Bryant Bagwell. [S392] Pattie Bagwell Wall, North Carolina Death Certificate: Pattie Bagwell Wall. Jenadius Jackson Bagwell was born on 28 August 1862 in Wake County, North Carolina.1 He was the son of Needham Bryant Bagwell and Isabella Hawkins Thompson.1 Jenadius Jackson Bagwell married Tina Cooper in 1883. Jenadius Jackson Bagwell died on 14 December 1930 in Wake County, North Carolina, at age 68. He was buried at Montlawn Memorial Park, Raleigh, Wake County, North Carolina. [S384] Needham Bagwell Grave Stone, Find a Grave, www.findagrave.com. Lonnie D. Bagwell was born on 24 July 1875 in Wake County, North Carolina. 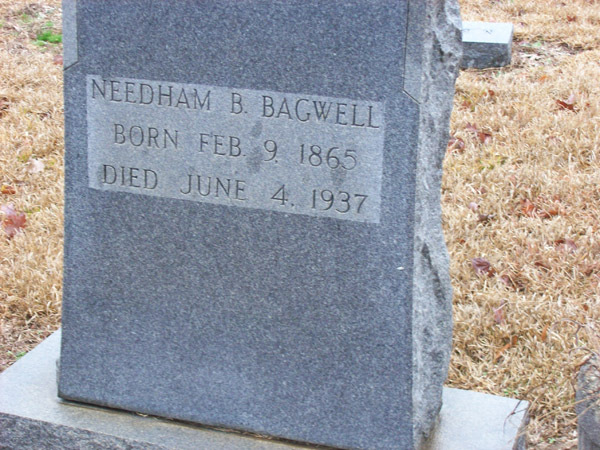 He was the son of Needham Bryant Bagwell and Isabella Hawkins Thompson. Lonnie D. Bagwell married Martha D. Stevens on 9 August 1893 at Wake County, North Carolina. Lonnie D. Bagwell and Martha D. Stevens lived in 1920 in Lynchburg, Lynchburg City, Virginia. Lonnie D. Bagwell and Martha D. Stevens lived in 1940 in Washington, District of Columbia. 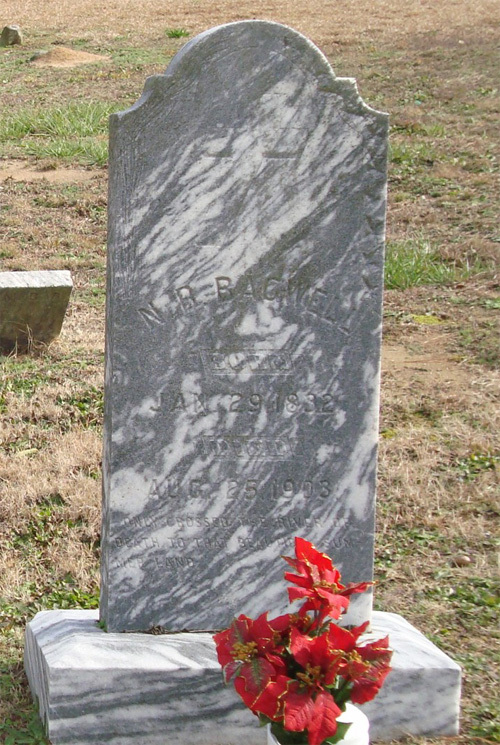 Lonnie D. Bagwell died on 6 May 1955 in Campbell County, Virginia, at age 79. Martha Poole was born in 1820 in Wake County, North Carolina. As of 30 December 1840,her married name was Bagwell. She married William Dosie Bagwell, son of Littleberry Bagwell and Mary Walker, on 30 December 1840 at Wake County, North Carolina. Martha Poole died in 1853 in Wake County, North Carolina. Minerva Hawkins Bagwell was born in 1841 in Wake County, North Carolina. She was the daughter of William Dosie Bagwell and Martha Poole. Minerva Hawkins Bagwell died on 18 April 1931. Martha H. Bagwell was born in 1843 in Wake County, North Carolina. She was the daughter of William Dosie Bagwell and Martha Poole. Catherine B. Bagwell was born in 1847 in Wake County, North Carolina. She was the daughter of William Dosie Bagwell and Martha Poole. Burline Baucom was born in Wake County, North Carolina. As of 3 January 1855,her married name was Bagwell. She married Grandberry Ross Bagwell, son of William Bryant Bagwell and Aisley Bunch, on 3 January 1855 at Wake County, North Carolina. Mattie Julia Morris was born on 14 June 1856.3 As of 3 December 1885,her married name was Bagwell.1 She married William Burke Bagwell, son of Green Berry Bagwell and Ann C. King, on 3 December 1885.1,2 Mattie Julia Morris died on 4 April 1950 in Wake County, North Carolina, at age 93.3 She was buried at Morrisville First Baptist Church Cemetery, Morrisville, Wake County, North Carolina.